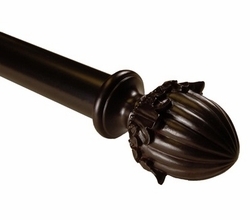 Bring some classic elegance into your home with the Acorn Curtain Rod Set. Let your inner royalty come out with this timeless design. Truly inspired by old world elegance, the Acorn Rod will perfectly compliment your exquisite tapestry or drapery to add that extra edge to your interiors. This adjustable tapestry rod extends to accommodate a range of window sizes and window treatment options. • 1.25-inch diameter poles adjust to accommodate a range of window sizes. • The curtain rod comes complete, including 2 finials, brackets, mounting hardware and installation instructions. • 5/8-inch diameter steel poles attach to brackets with high-quality set screws for a safe and secure installation. • The adjustable brackets can expand from 3-inch to 5-inch, which allows plenty of space for mini blinds, roller shades and other window treatments. • Minimal care required - simply wipe clean with damp cloth. • When measuring your windows, remember to consider adding roughly 4-Inch to each end (the space the finials will take up). • Consider the stack back space necessary for hanging draperies; stack back space is the width drapery will occupy when fully open. • You can complete your window look with matching holdbacks (set of 2) sold separately. • If hanging a standard drapery, use our heavy-duty clip rings (set of 14) sold separately. • Remember to consider how long the curtains will hang, because treatments hanging too low to the ground or too high might not look correct. • Always a good rule of thumb is to measure everything before installation.